Looking for a short list of the best backpacking sleeping bags? Skip to the end of this article. Debating about whether to purchase a backpacking quilt instead? Not sure what to think about in the sleeping bags versus backpacking quilts dilemma? Looking for the features to consider when facing the purchase of a new backpacking sleeping bag? You can go at this problem of selecting a new sleeping bag from several different directions. And that's going to take a bit of introspection. Are you a cold sleeper? The very first thing to get real about is how cold you are as a sleeper. If you're a woman who wears footie flannel pajamas to bed and pulls the down comforter up around your ears - in the summertime - your search for the a backpacking sleeping bag is going to be substantially different from a hiker who tosses off the covers in mid-winter. So don't fool yourself into thinking that you will magically morph into a different type of sleeper under the influence of trail magic. If you run cold, the temperature rating of the sleeping bag is your first consideration. For a three season female backpacker, start looking in the +20F range of women specific sleeping bags. If you know that you're not an extremely cold sleeper, look in the +30F range. Caveat: These are general ratings, and somewhat unreliable under variable conditions. Luckily, you can game the system to add warmth to a bag after you purchase it if you find it's a bit too chilly for cooler conditions. use the adjustment features (coming up) to vent, or cover, yourself as needed. Another consideration is the type of shelter you'll be using on your backpacking adventure. Each of the following choices provides more (or a lot less) shelter from wind, moisture and cold temperatures. So be sure to dial down your required warmth rating if you're going to be well protected from Mother Nature's wrath. Each of us has a favorite way to fall asleep. I would be shocked if you didn't already know what yours is, but just in case, keep track over the next few nights. This information is useful when it comes time to narrow down your choices to find the best backpacking sleeping bags for your sleeping style. Keep reading to combine your sleeping position with your best choices in sleeping bag designs. What's your level of sleep activity? I've noticed over the years that some people are what I call "thrashy" sleepers. They start out in one position, but over the course of an 8 hour sleep cycle, they move around. If you've shared sleeping quarters with a thrashy sleeper, you know what it's like to be startled out of a sound sleep by someone's elbow in your ear. Other hikers do their best impersonation of a rolled up rug: put them in one position, and you'll find them in that exact same spot in the morning. And let's be realistic: some of us alternate between these two extremes depending upon what we had for dinner, how much alcohol or caffeine was consumed in the evening, our stress levels, any physical pain we're experiencing, and the dreams we dream. Let's answer that question as we look at the types of designs you can expect to find in the best backpacking sleeping bags. and not wanting to spend, or carry, more than they need to. Before we look at the shape of the bag, let's look at what's inside. You have two basic choices in the best bags on the market, and they will put you firmly into one camp or another in terms of how warm you will stay if your sleeping bag becomes more than a little damp. They will also put you into different price and weight ranges. Keep in mind the warmth to weight ratio as you read. No doubt about it, a backpacking sleeping bag filled with synthetic material will be cheaper up front when compared with a down filled bag. It will also be heavier, adding additional weight to your load. This becomes more important as the length of your backpacking trip increases. And here's something that might not occur to you if you've never handled a down filled sleeping bag: it's harder to compress a synthetic filled sleeping bag. This matters to you because of the volume in your backpack. Every precious liter counts, and you don't want your sleeping bag to hoard room that other gear needs. Not sure about backpack volumes? Read this. The best backpacking sleeping bags should last several seasons - or more (unless you do something egregious to it). A synthetic filled bag will not have a remarkably long lifespan because synthetic fill will lose loft over time, even more quickly with frequent usage. Loft = ability of the material to keep your body heat where it belong: inside the bag and around you. Think "fluffiness". See below for more details on loft. One final important note about synthetic fill sleeping bags. They are miserable to sleep in when they get fully wet. I hope you never, ever have to crawl into one, because that's one badge of veteran hiking that you don't want to earn, trust me. However, they do have the advantages of retaining some insulating ability when soaked, and drying more quickly than down. These can be worthwhile (and possibly life saving) advantages on a multi-day backpacking trip. Think carefully about this if you're headed into reliably wet conditions. And for hikers who need a hypoallergenic and vegan option, synthetic is the way to go. I've used synthetic filled bags, and down bags, and to be honest I'm going to state that I prefer down sleeping bags. Here are my top three reasons: insulation, weight, and water resistance. Down has admirable insulation properties. Feathers keep birds warm in extremely cold environments, so why not borrow a trick from Mother Nature? Down is also feather light, making it possible for a well insulated bird to get off the ground. And also making it possible for a woman to carry a sleeping bag for multiple days, right? And here's a fabulous innovation: water resistant down. Combined with water resistant shell fabrics, it takes a lot of exposure to water to get a down sleeping bag wet enough to lose its ability to keep you warm. You are using technology to keep the contents of your backpack dry in all kinds of weather, right? A well fitted pack cover, or a heavy duty trash bag to line the inside of your pack... or using dry bags to stash your gear. Guess who uses all three? Worry wart me! Now for the bad news about down: the best backpacking sleeping bags filled with down will be more expensive, and require a bit more care than a synthetic fill bag. If you're in this backpacking thing for the long haul (backpacking humor! ), down will lighten your load, extend the life of your bag, and create a cozy nest for your dream time on the trail. So start saving up! Tip: Never store your down sleeping bag compressed in a stuff sack or inside your backpack for longer than a day. Once you're at home, hang it up in your gear locker to avoid creating a "dead spot" where the down has lost its loft. If you've decided to purchase a down sleeping bag, you're not done yet. Before we get into the profile of the bag, there's one more number you need to pay attention to: down fill power, reported in a range of 550 to 900. Power determines how fluffy the down (small feathers located beneath the waterproof outer feathers on ducks and geese) will be if you see a pile of it. The technical name for this is loft. Geeky fact: The sleeping bag manufacturers determine loft by placing a known weight of down into a graduated cylinder to measure the volume the feathers occupy. This value is reported in cubic inches in the United States. And it stands to reason that the more loft, the more insulating value those feathers will give you because they will trap your warmth more efficiently. As long as you keep the down sleeping bag from being compressed or becoming soaking wet. If you're a beginner three season backpacker, start out by looking at 800 fill power to get yourself comfortably through your first few years of backpacking. If you're a summer only backpacker, you can get away with less, but as a female cold sleeper, I wouldn't go below 700 without carrying additional technology for warmth if the weather decides to turn on me. 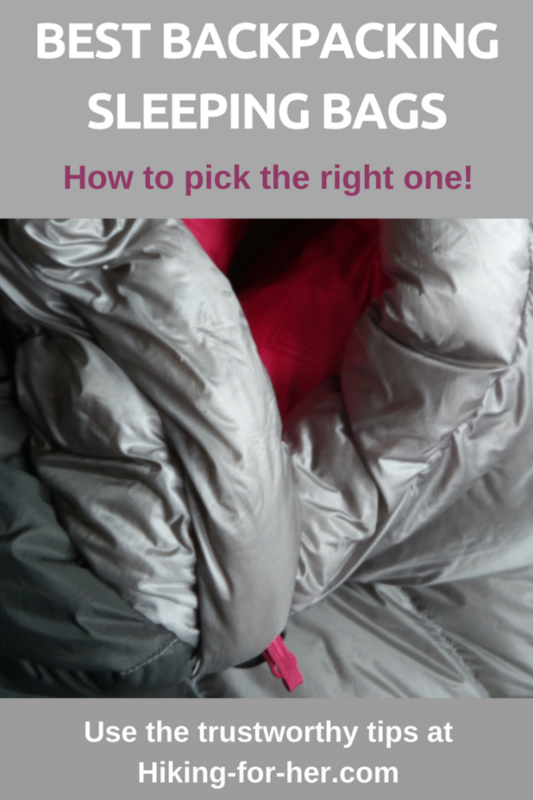 To see how I approach the task of choosing a high quality sleeping bag, read this. The profile of the best backpacking sleeping bags hews toward the mummy style. This means there is a hood that can be cinched down around your face, making you resemble ... well, you're probably already ahead of me here. There are various degrees of mummy-ness however. And that's important for women hikers who are looking at the best backpacking sleeping bags for their gender. Why buy a bunch of excess material to haul around if you're a petite or slender female? You want a trim profile to your sleeping bag, without giving up warmth but gladly giving up extra weight. You probably don't need a full length zipper. If you're a thrasher, a very trim profile for a mummy bag might induce nightmares, quite literally. Even some non-thrashers might find mummy bags to be confining and restrictive when it's time to roll over. If that could be a problem for you, consider a backpacking quilt instead. Another consideration: your preferred sleeping position. Pay attention to where the zipper is located on a prospective sleeping bag. Determine if your dominant hand, combined with your sleep position, will appreciate the length and placement of the zipper. Makes those midnight trips to the bushes much less arduous! And one more dimension I have not mentioned yet: length. Some bags are available in short, regular and long lengths, giving you the ability to factor this into your search for the best backpacking sleeping bags for you. Need some suggestions for sleeping bags to look at? This North Face sleeping bag gives you plenty of room but also provides some safe guards against chills: closely fitted hood, draft collar, and internal hand warmer pockets. Marmot makes this 30F bag with a streamlined fit, with one of the lowest price points you'll find in backpacking sleeping bags. NEMO has created the perfect bag for curling up in the fetal position, purposely designed with extra room at elbows and knees! Which one of these descriptions fits you best? There's a bag waiting just for you! If you are truly concerned about sleeping warm enough for restful sleep during a backpacking trip, this Marmot bag is the answer. It's not cheap, but it's one of the best light weight bags to eliminate temperature concerns. If you are looking for a "generalist" type of sleeping bag to go along on different types of three season backpacking trips, here's the one I use. It's a perfectly cozy cocoon for the cool, damp conditions I love to hike in, and roomy enough to accommodate my side sleeping habit. Do you feel claustrophic in bags with side zippers, especially if they aren't full length? Take a look at Patagonia's 850 fill bag. It has a zipper right up the middle, with a slim footprint. It's available in 3 lengths. Cotopaxi's Sueño sleeping bag offers versatile zippers: a traditional right-side zipper, plus a half-length zipper on the left side. So depending on ambient temperature and your own temperature fluctations (think menopause or pregnancy), you can fold the top section of the bag up or down, or completely unfold it as a blanket covering. Psssst... you should also be considering backpacking quilts. Tip: When you spot a great deal, jump on it. These merchants don't keep a steady inventory, so if you wait even one day to purchase, it's likely that the item you want will be long gone. But that's what makes visiting these website so much fun! You never know exactly what you'll find. 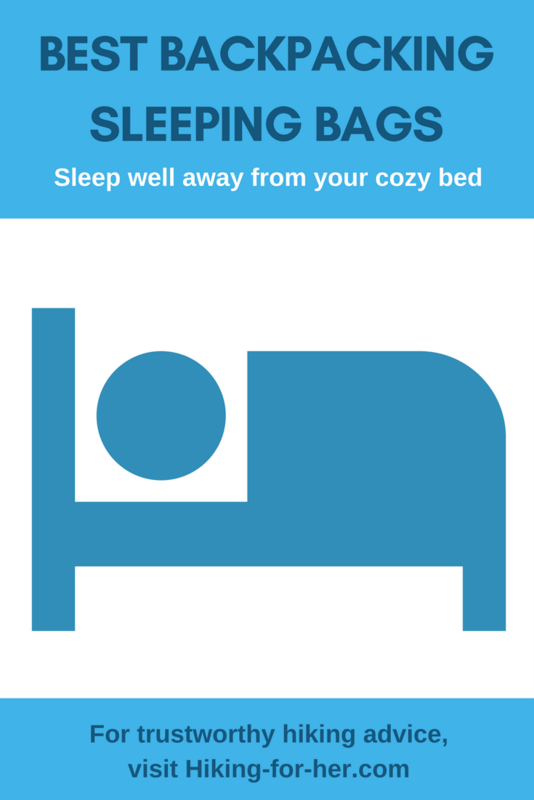 Sleep well when you're well away from your bed! Now that you've read all about how to approach your search for the best sleeping bags, Hiking For Her is standing by to answer your sleeping bag questions. If I'm not using my sleeping bag in the backcountry, expect a reply within a day or so! All of the free hiking information and advice on this website is due to the generous support of readers like you. If you purchase your hiking gear (like one of the best backpacking sleeping bags) through links on this page and elsewhere on the site, Hiking For Her receives a small percentage of your purchase price. But you don't pay anything extra. Thanks for supporting quality merchants and this website with your hard earned cash!